Founded as the Flagship brewery in 1995 by Andrew Purcell after being made redundant from his post as a local government officer. 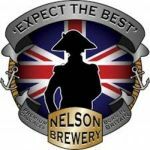 The brewery is in Chatham Dockyard where Nelson’s flagship, Victory, was built. Was taken over after liquidation in 2003, and renamed Nelson. Was bought by Piers Macdonald in July 2006. Cask and bottle conditioned. Distribution East Kent. Likely outlet: Man of Kent, Rochester.